Subject: Your accountant license can be cancelled. We have received a complaint about your recent participation in tax return infringement for one of your employers. According to AICPA Bylaw Subsection 730 your Certified Public Accountant license can be withdrawn in case of the occurrence of filing of a false or fraudulent tax return for your client or employer. Please familiarize yourself with the notification below and provide your feedback to it within 14 days. The failure to do so within this term will result in cancellation of your CPA license. 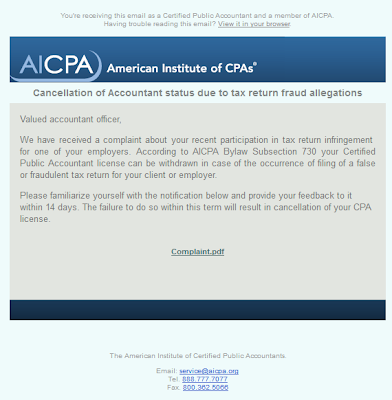 I haven't seen AICPA themed spam for a long time, but this follows an established pattern. The link in the email goes to a legitimate hacked site and then on to a malware payload at [donotclick]www.aicpa.org.children-bicycle.net/news/aicpa-all.php (report here).. but only if the visitor is running Windows (more of which in a moment). The domain children-bicycle.net is registered with fake WHOIS details and the pattern of the domain mark it out as belonging to the Amerika gang. As I mentioned, the code detects the visitor's OS and only sends the victim to the exploit kit if they are running Windows, others end up at the genuine aicpa.org website (click to enlarge). Subject: Tax return assistance fraud. You're receiving this message as a Certified Public Accountant and a part of AICPA. Having any issues reading this email? Overview it in your favorite browser. We have been notified of your potential participation in income tax refund shady transactions for one of your customers. In concordance with AICPA Bylaw Head # 740 your Certified Public Accountant status can be terminated in case of the act of submitting of a phony or fraudulent tax return for your client or employer. Please be informed of the complaint below and respond to it within 7 work days. The refusal to respond within this period will finish in cancellation of your Accountant status. Subject: Your accountant license can be end off. Having problems reading this email? Review it in your browser. We have received a complaint about your alleged participation in income tax return fraudulent activity for one of your employees. In accordance with AICPA Bylaw Section No. 500 your Certified Public Accountant license can be terminated in case of the event of presenting of a false or fraudulent tax return for your client or employer. Please find the complaint below below and provide your feedback to it within 3 work days. The rejection to provide the clarifications within this time-frame would abide in end off of your Certified Accountant Career. In this case the malicious payload is at [donotclick]eaglepointecondo.org/detects/denouncement-reports.php hosted on 59.57.247.185 in China, as with the earlier spam run today. Subject: Income fake tax return accusations. Having difficulties reading this email? Take a look at it in your browser. We have received a denouncement about your probable interest in income tax return swindle for one of your customers. In concordance with AICPA Bylaw Head # 500 your Certified Public Accountant status can be revoked in case of the occurrence of submitting of a faked or fraudulent income tax return for your client or employer. Please be notified below and provide explanation of this issue to it within 21 business days. The rejection to provide elucidation within this period would finish in end off of your CPA license. The malicious payload is at [donotclick]eaglepointecondo.co/detects/denouncement-reports.php hosted on 59.57.247.185 in China, which has been used a few times recently for malware distribution. You're receiving this information as a Certified Public Accountant and a member of AICPA. Having any problems reading this email? See it in your favorite browser. We have been informed of your potential involvement in tax return swindle on behalf of one of your employers. In obedience to AICPA Bylaw Article 700 your Certified Public Accountant position can be discontinued in case of the aiding of filing of a phony or fraudulent income tax return for your client or employer. Please be notified below and provide explanation of this issue to it within 14 work days. The rejection to provide elucidation within this time-frame would finish in decline of your Accountant status. Subject: Tax return assistance contrivance. You're receiving this note as a Certified Public Accountant and a part of AICPA. We have received a note of your presumable interest in income tax fraud for one of your clients. In concordance with AICPA Bylaw Article 600 your Certified Public Accountant status can be discontinued in case of the event of submitting of a fake or fraudulent income tax return on the member's or a client's behalf. Please familiarize yourself with the complaint below and provide your feedback to it within 14 work days. The rejection to respond within this time-frame will result in end off of your CPA license. The malicious payload is at [donotclick]ibertomoralles.org/detects/five-wise_leads_ditto.php hosted on the same Chinese IP address of 59.57.247.185 as used in this spam yesterday. We have received a complaint about your possible participation in income tax refund fraudulent activity for one of your clients. According to AICPA Bylaw Paragraph 730 your Certified Public Accountant license can be withdrawn in case of the fact of filing of a misguided or fraudulent tax return for your client or employer. Please be informed of the complaint below and respond to it within 7 days. 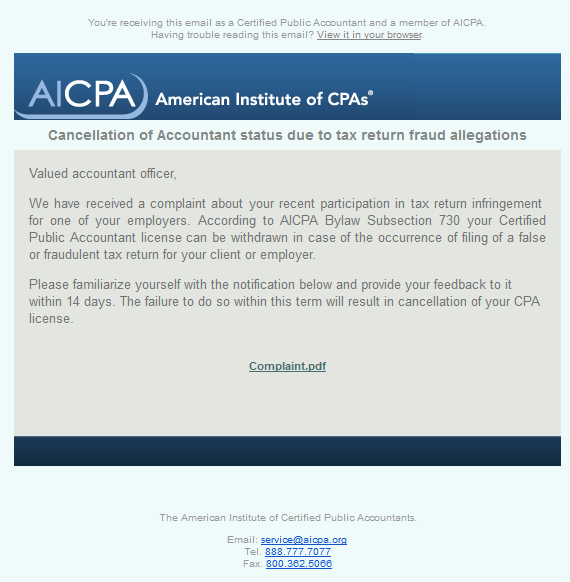 The failure to respond within this term will result in cancellation of your CPA license. 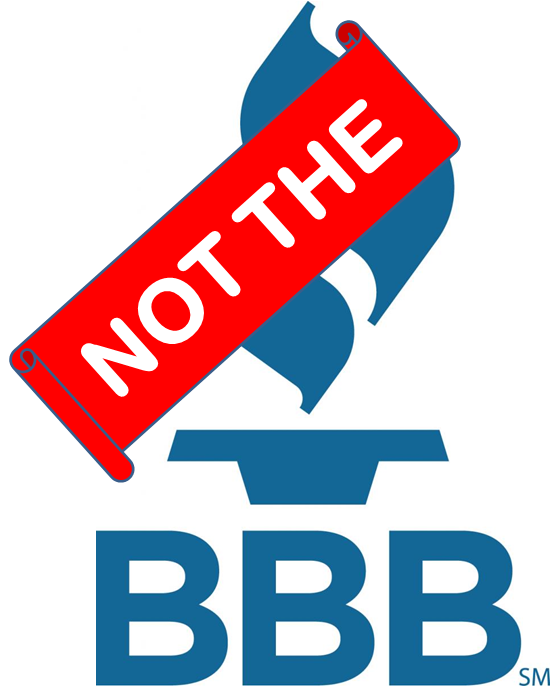 We have been notified of your possible involvement in tax return fraudulent activity for one of your employees. According to AICPA Bylaw Paragraph 730 your Certified Public Accountant license can be cancelled in case of the occurrence of presenting of a misguided or fraudulent income tax return on the member's or a client's behalf. Please familiarize yourself with the notification below and respond to it within 14 days. The failure to provide the clarifications within this time-frame will result in termination of your Accountant status. The IP appears to be 41.64.21.71 (Dynamic ADSL, Egypt). This IP has been seen many times before, so blocking it would be a very good idea.